This week while doing some background research on our historic County Courthouse, I came across an issue of the local newspaper, the Jackson Progress Argus, from August 16, 1973. As often happens on a research project, I quickly became engrossed in reading about the affairs and goings on in the small community I call home, at a time when my then-seven year old self could hardly have cared less. As I read on, however, I began to realize how much communities and local newspapers have changed over the past 45 years and that perhaps it happened so slowly we didn’t realize it. There is no doubt the Jackson Progress Argus is the longest going concern (I noticed that they used that term a lot back in 1973, a “going concern”, to describe when something was active and thriving) in our community, dating well back into the 19th century, although it has changed ownership a few times since it opened its doors. It’s also been helmed by a number of editors and publishers, individuals who made their imprint on local history with words banged out on noisy old typewriters and committed to paper with ink that used to come off on your fingers as you read through the pages. In reading “the paper”, a window into the life of one week in my hometown was opened to me, and I was given a chance to step back in time and experience what the matters of local interest were when Nixon was President, gas prices were escalating, honeydew melons were 79¢ at the A & P and a local dairyman nearly blew himself up. Serious news aside, though, were the “Personals” and it is here that you really got a look at the things going on in the community. I remember the Personals well, because they were still going in the newspaper up until the last of those intrepid local reporters, those ladies of society teas and garden club parties, had moved on from this life, never to be replaced. 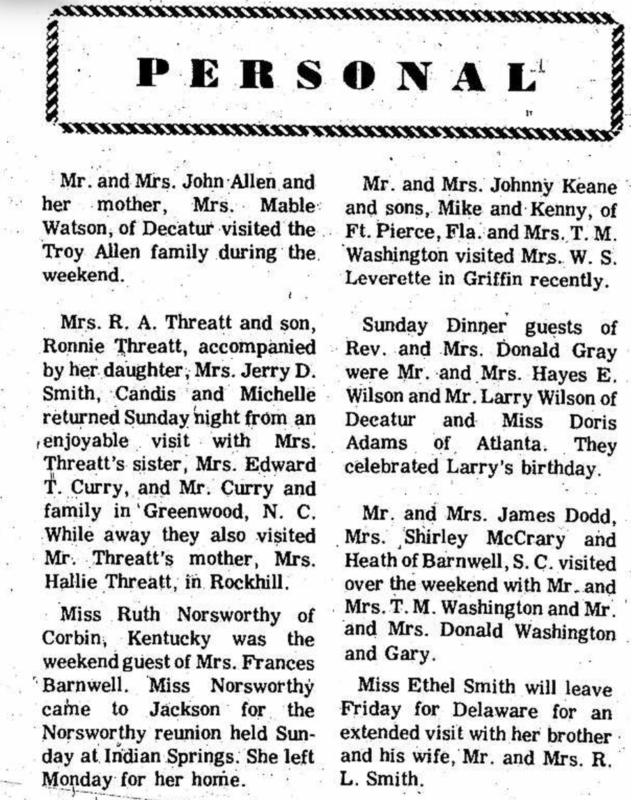 My grandmother used to sit in her chair and clip the Personals each week from the local paper whenever she saw something of interest, and share them with us anytime one of our own names appeared in them. I can tell you from firsthand experience that I never spent a weekend at my grandparent’s house in Jenkinsburg, or went to dinner with them just across the highway at my great-aunt Louise’s house or was a guest with my grandmother at her garden club meeting without it appearing in the Personals, reported faithfully by Flora Price. Still, I was amazed to see just how much Personal news there was to report in the early 1970’s, far more than I remembered from the 80’s and 90’s. Worthville was apparently a happening place in 1973, as reported by a Mrs. W.G. Avery in the “News from Worthville” section of the paper. Sunday in particular was “visiting day” in our community, and Worthville was no exception…a single Sunday could provide a cornucopia of news on who visited who, especially when so and so “visited from out-of-town” or when grandchildren were left behind for a stay. I especially enjoyed reading about the quarterly meeting of the Metro Atlanta Postmasters held at the Jenkinsburg Clubhouse (a place I enjoyed many Sunday dinners at, all of which were reported by Miss Flora). “Acting as official hostess for the affair, Mrs. Thomas Sims (Miss Majorie to me), Jenkinsburg postmaster, cordially greeted each of the 29 delegates as they arrived. Mrs. Hughlan Price (Miss Flora) gave the invocation and all the guests were served luncheon buffet style. They were seated at the lovely tables laden with white linen covers and decorated with baby ivy vines…the delectable foods which consisted of baked ham, fried chicken, a wide variety of vegetables, salads, desserts and beverages were immensely enjoyed by all who attended”. This kind of verbiage not only highlighted the literate abilities of the writers and their prodigious use of adjectives, but now their unique and highly descriptive observations, as intended, had my mouth-watering 45 years after that meal was served. This was reporting, before the days of 240 character limits, public perception and political correctness forced writers to curb their enthusiasm. We even had a SOCIETY section then! I learned that one local citizen was “betrothed” to another, and that the “bride-elect” had a degree from the University of Georgia in chemistry and zoology, while the groom was “currently employed by Richway as manager of the children’s department”. Another clip from the Society page announced the birth of a boy to a local couple, noting that the baby’s mother “is pleasantly remembered as the former Miss B of Jenkinsburg”. Isn’t it nice to be pleasantly remembered for who you were? 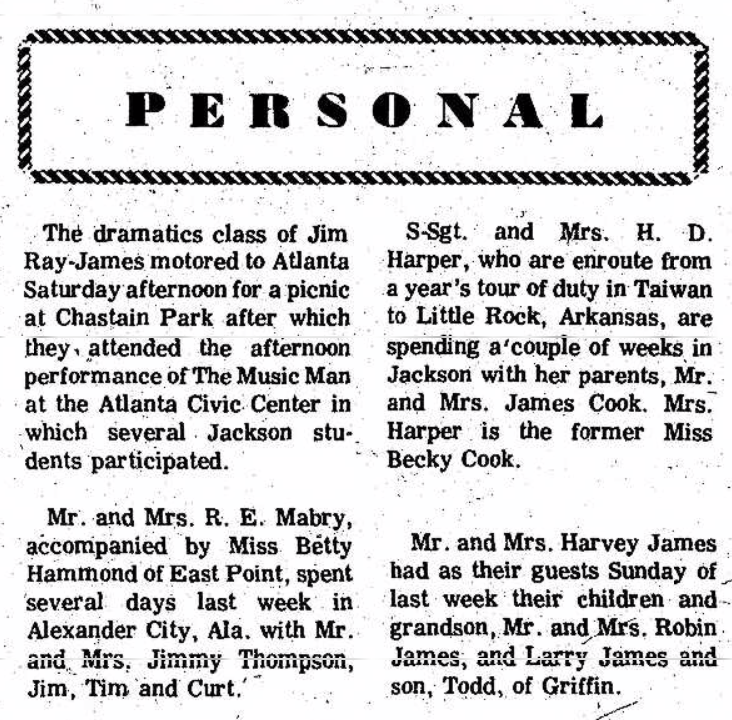 Speaking of, I was pleasantly reminded by one of the Personals of the dramatics class that I and several other local children were affiliated with, which read “The dramatics class of Jim Ray-James motored (we motored!) to Atlanta Saturday afternoon for a picnic at Chastain Park, after which they attended the afternoon performance of The Music Man at the Atlanta Civic Center in which several Jackson students participated”. I must disclaim here that while I did go and was intended to be in the performance, typical first grader stage fright won the Oscar for that evening. I say all of this now because I honestly didn’t appreciate it then. When my grandmother read clippings of what we did the weekend before, I would usually roll my eyes and move on to the important matters at hand such as the color TV or what to build out of Lego. I didn’t appreciate the efforts and hard work of that dedicated group of ladies throughout our community, whose delightful reports on the everyday happenings of life in a small town could turn the mundanity of a Sunday afternoon into an affair which was “enjoyed to the delight of all present”. I realize now that without that army of local observers, watching and reporting on the news of the week, that the hometown newspaper would not have been the same, like food without salt and pepper to give it a bit more flavor. Even the paid news reporters and editors went all out to report the serious news of the day with highly descriptive words, such as the aforementioned accident where Mr. W nearly blew himself up by pouring gasoline on a fire to help get it started, chronicling the event in tremendous detail and extolling the heroic efforts of two “men from Jonesboro” that saved his life and transported him to the hospital. Other local news headlines (front page news) included “Hilderbrand Named Cashier at C&S Bank” (he was one of my first bankers) and of course “Butts County Schools will Open August 27th” where they named every single teacher and administrator in the entire system that would open the 1973-1974 term. Elizabeth Watkins, one of my favorite people from the past, was a featured photo subject on the front page for being given an entire silver tea service for 25 years of service to the “Co-Op” (Central Georgia EMC). None of this was earth shattering news, or major world events that would make much of a difference to anyone outside our little part of Georgia…but it was big news around here, small moments of everyday life captured in print and preserved for future generations to discover and enjoy. It’s a very different news world today in 2018 than it was in 1973, a time when hometown newspapers didn’t have to rely solely on too few staff to cover only the most important local events and happenings. People looked forward to their weekly newspaper so they could see what all their friends and members of “Society” had been up to over the past seven days, pages and pages of literary enlightenment, all for the sum of $5.00 per year. My wife summed it all up for me when I lamented the loss of our written history of family parties, garden club luncheons, weddings, civic club meetings, birthdays, and gripping news stories about real people and what they dealt with. She said we have Facebook for that now, and she is right. The Personals aren’t really gone, they’ve just moved on to a new format, taken on a life of their own and are there in our face each time we scroll the feed. But sometimes I can’t help thinking that without editors or space limitations, without thought and sometimes even without good grammar and literacy, that a lot of what we had is slipping away fast. I find I miss the Flora Prices and the Carolyn Cooks to regal us with their stories, and appreciate them far more than I did when they were here and churning them out. Sometimes seeing life’s events through an observant, interested chronicler is better and more engaging than reading about them from the first person perspective that we get on Facebook and Twitter today, much as I enjoy sifting through them and contributing my own. History is far more than just the big events that shaped our state, our country and our world at the time; it’s also about the little day-to-day things that went on around us, that drew us closer together as a community and made us care a little bit more about each other as friends and neighbors. Small town newspapers still help bind us together and bring awareness of the things going on around us. I hope they are around for a long time to come, “to the delight and enjoyment of all concerned”.